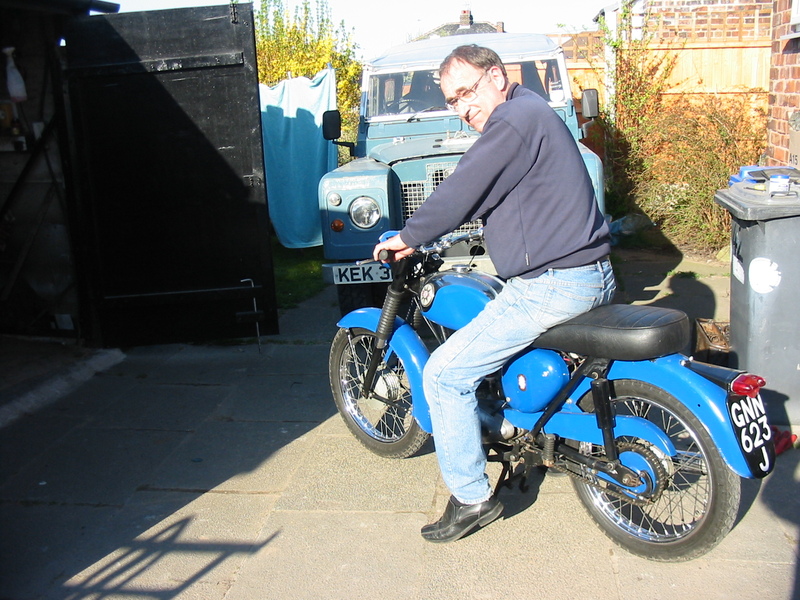 Thanks to Club Member Gary (Bee175) for making this fantastic guide available. This guide has been written to assist someone that is doing this for the first time, or at least, not for a very long time. 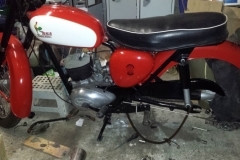 It is assuming a starting point with the parts as detailed in the first picture, and with the gear selector plate correctly assembled (help with that further down the page). Be aware that the 2 sliding gears are different. 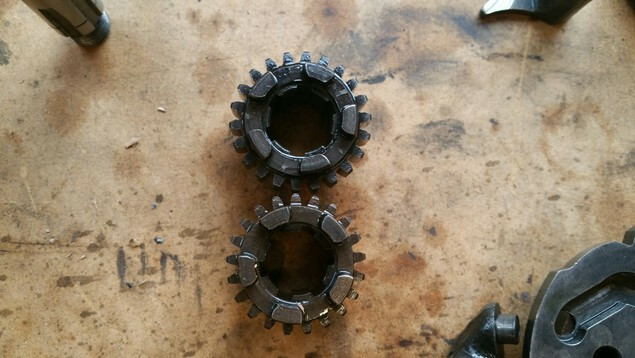 The one at the top of the picture (main-shaft) has 22 teeth and the one below (lay-shaft) has 21. 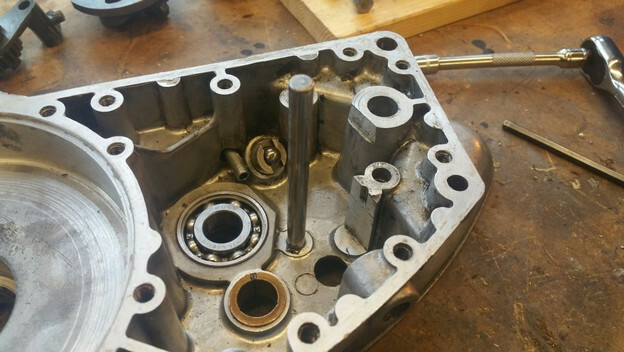 Ideally, the right side engine casing will lay flat on your chosen work area. 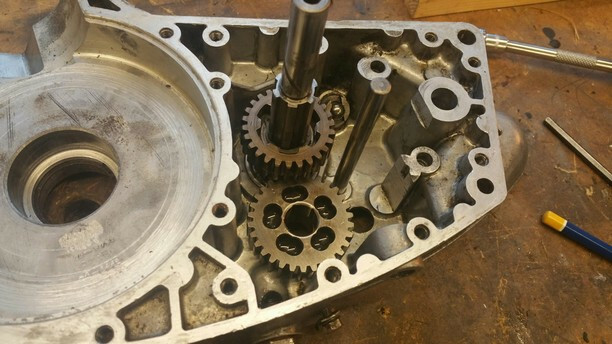 I drilled 3 holes in my bench to facilitate an earlier engine split (see pictures below), and will utilise these, but best to check with the other half if working in the kitchen. 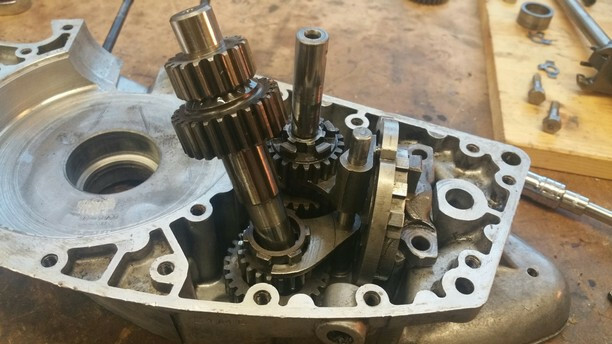 From crankshaft centre to main-shaft centre is 4” and main-shaft centre to gear lever shaft centre is 2 13/16”. I used a 20mm bit for the holes but if you insist on imperial, then a 0.787402” drill bit, is what you will need, if you’ve got one. 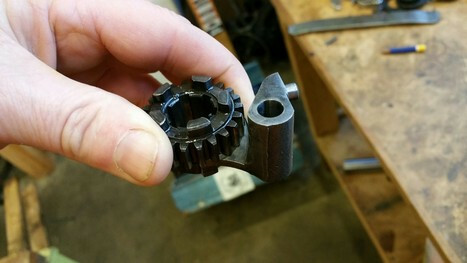 When splitting cases, the main-shaft can be secured underneath the bench with the clutch centre nut, holding the casing to the bench. 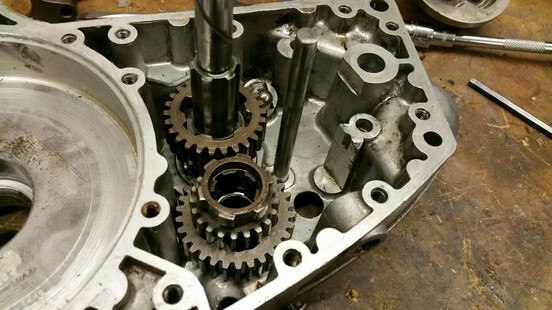 An easier way of achieving this of course, would be to use a workmate with the jaws open, using the jaws to clamp the main-shaft for case splitting, but I prefer the more time consuming and slightly eccentric method. The 3 holes I drilled in the bench. The 3 drilled holes from under the bench. 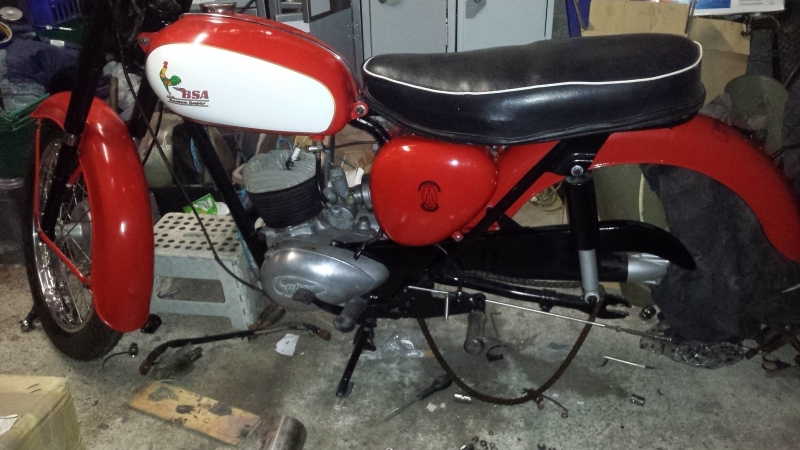 Place the detent spring, ball seat and ball bearing in position. 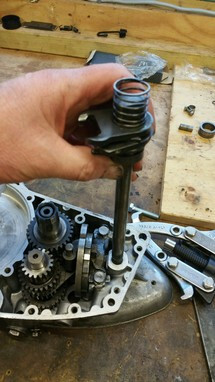 Place the selector fork spindle with the circlip to the bottom. 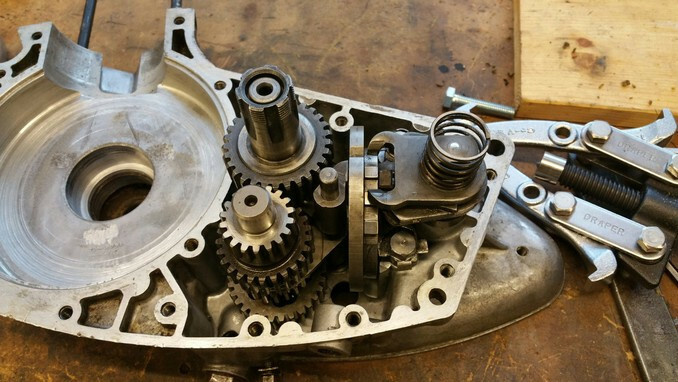 Place the first main-shaft section pushing it through the main-shaft bearing until it seats. A rubber mallet can be used if it is too tight to push through by hand. If it’s too tight for the mallet, try freezing the main-shaft for 30 minutes first. If it still won’t go in, something is up! The first main-shaft section seated. 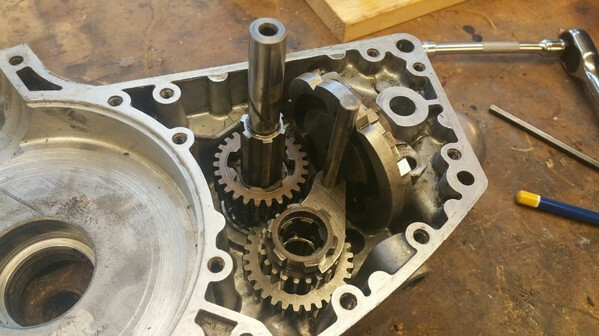 Place the first lay-shaft cog loose over the lay-shaft bush with the 5 holes facing upwards. 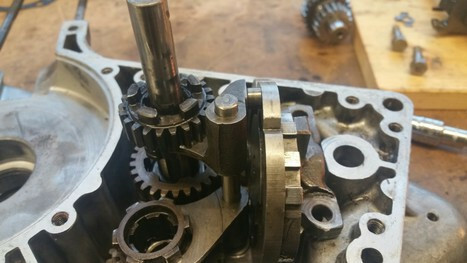 Place the lay-shaft sliding gear (21 teeth) on top of the first lay-shaft cog, so that the 5 lugs fit in the 5 holes of the bottom cog. 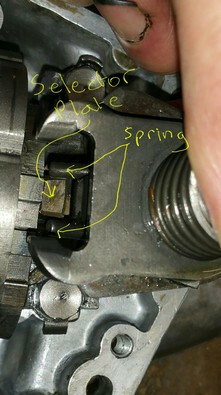 Lower the selector plate into position as shown in the picture. 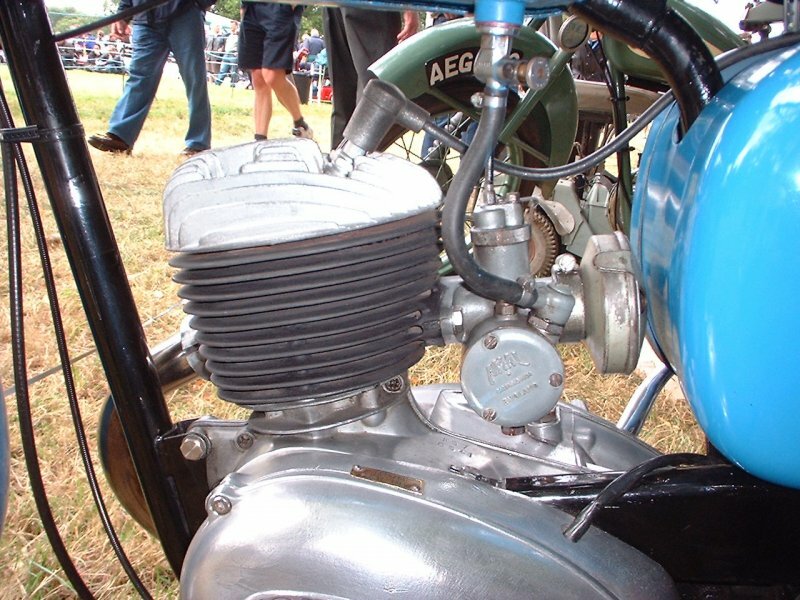 The green arrow shows where the detent ball bearing will sit (first gear indent I believe). 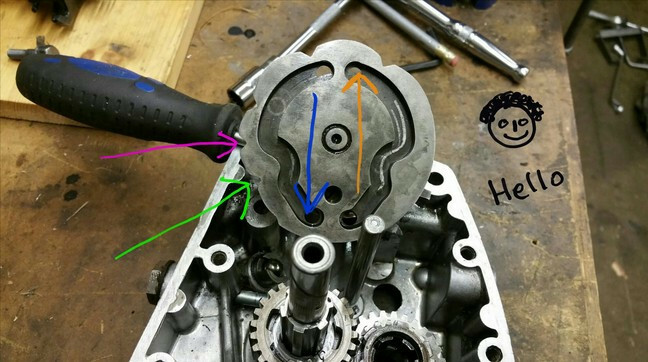 The blue arrow shows roughly where the lay-shaft roller will locate and the orange arrow shows where the main-shaft roller will locate. The pink arrow shows the neutral indent. 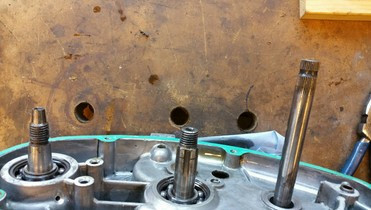 The next 2 pictures show the rough position of the selector plate from the side and above, once lowered into position. 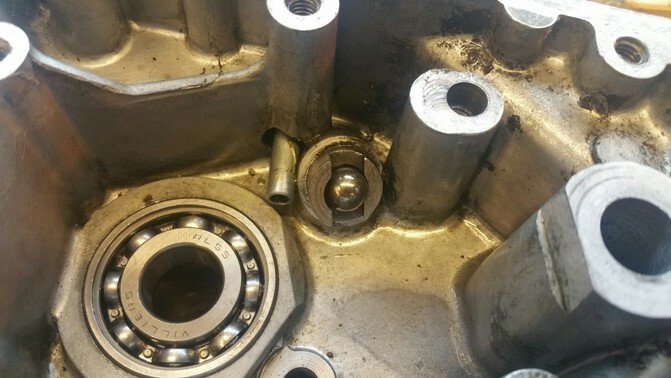 The bolt holes don’t quite line up at this point. 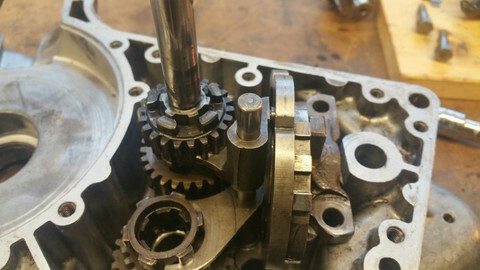 Lower the lay-shaft selector fork (roller held on with a little grease) onto the selector spindle, squeezing between the selector plate and main-shaft cog on the way down. 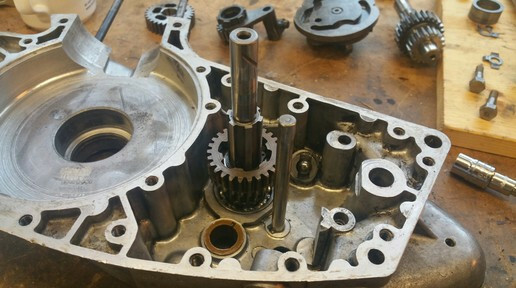 Once near the bottom, turn the fork clockwise so that the roller locates in the selector plate slot, and at the same time, the fork locates in the groove on the lay-shaft sliding gear, (you may need to raise the sliding gear slightly). Going down towards the slot in the plate. 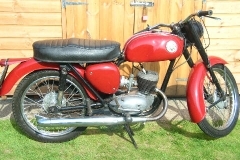 Roller in the slot and the fork in the sliding gear groove. 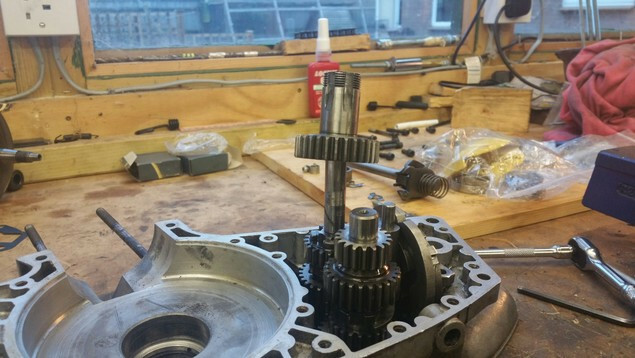 Lower them together onto the main-shaft and selector spindle at the same time, keeping them together. Lean the selector plate to the right and lower them some more until the roller goes past the top edge of the selector plate and into the selector plate slot, noting that it’s position is indicated by the orange arrow in the earlier picture. 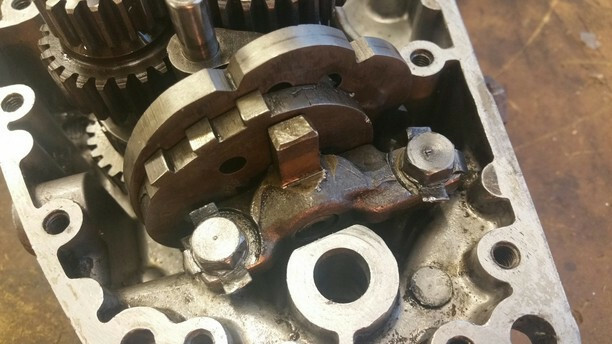 Roller located in selector plate slot. 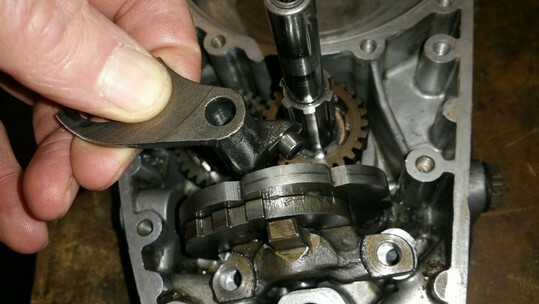 Next, lower the lay-shaft through the lay-shaft sliding gear, then through the loose lay-shaft cog beneath, and finally locating into the lay-shaft bush. 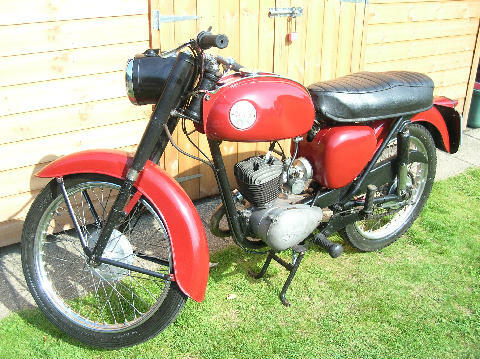 This might take a little jiggling so be careful not to dislodge the selector fork rollers from the selector plate. Wiggle wiggle, wiggle, wiggle, wiggle and it’s in. 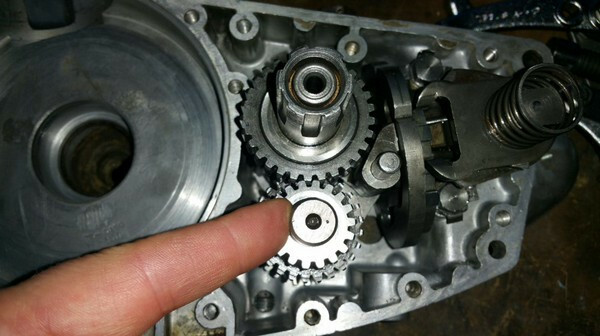 Then slide the final main-shaft cog onto the main-shaft, checking that the top 2 gears are flush. 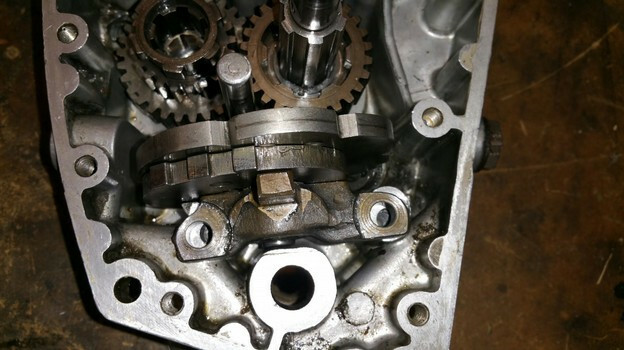 Alternatively, you can fit this part into the other casing first, but it is a good idea to place it on the main-shaft temporarily to check the top 2 gears are sitting flush. Have a little look around, using a torch if necessary, to check that the selector rollers are still in place. 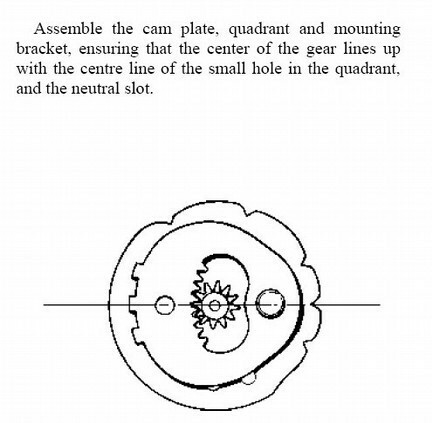 Roll the selector plate until the ball is sitting in the neutral indent (remember the pink arrow?). 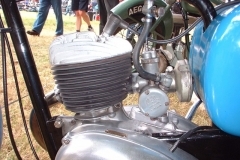 Then bolt the selector plate into place using the proper bolts and tab washers, or any suitable bodge to make sure those bolts don’t come loose. Check again that the rollers are in place. 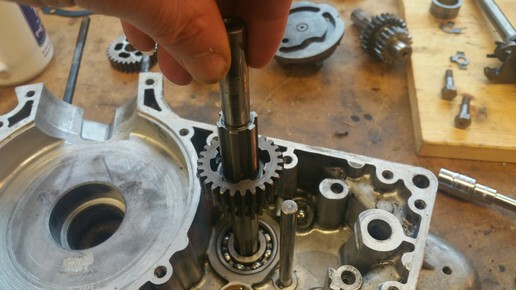 Now check that the gears spin nicely using the main-shaft. 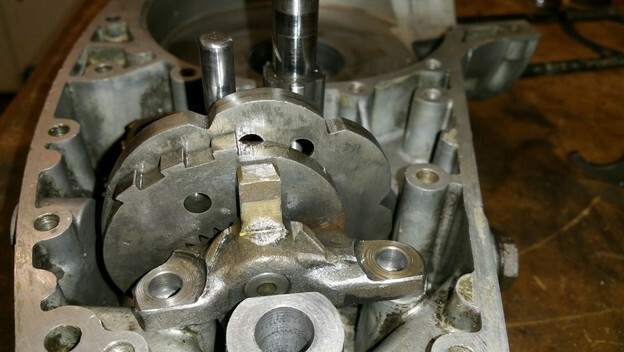 It may be necessary to place a little sideways pressure on the end of the lay-shaft when spinning the main-shaft. The direction of the pressure will change, depending on which way you are spinning the main-shaft. 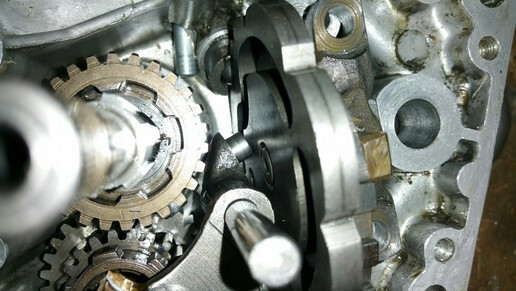 To spin the main-shaft clockwise, push the lay-shaft gently to the right, as in the picture. 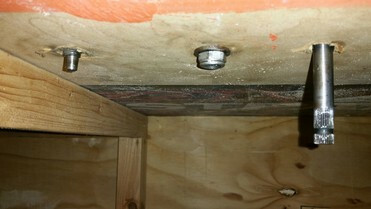 and place it in the hole in the casing, and through the hole drilled in the kitchen worktop earlier. 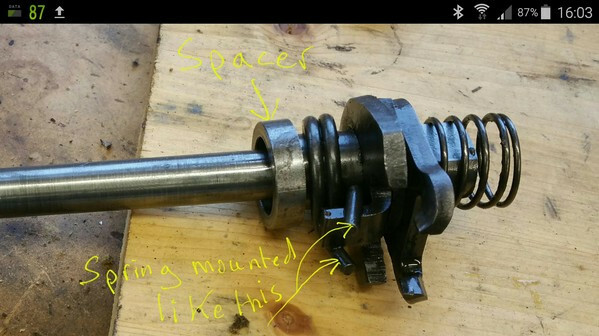 Make sure the selector spring ends locate 1 either side of the lug on the selector plate. 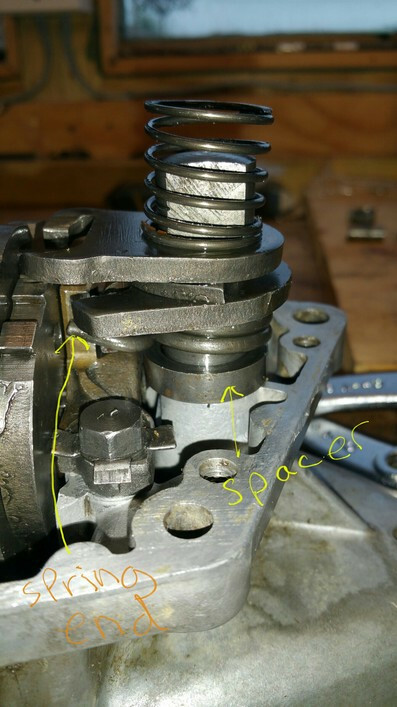 Make sure the spindle drops into the spacer properly and the selector spring end should look a bit like this. 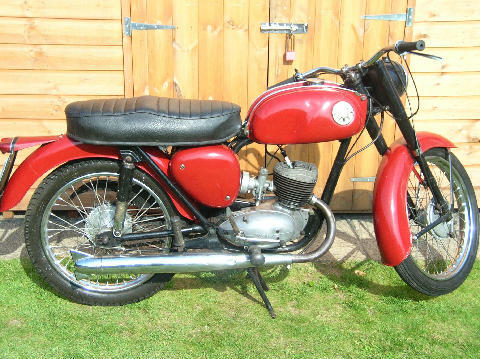 And hopefully it will look like this. ADMIN EDIT:- Also available as a ** Please log in to view **. There is a mention here ** Please log in to view ** of why you might not want to do that! I have rebuilt several 4 speed boxes and always had a bit of a problem aligning everything and felt another pair of hands would have been useful. However, I finally decided to read carefully and follow the instructions in the official wsm and it goes together easy peasy!! 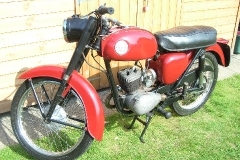 It is slightly different to the above write up. 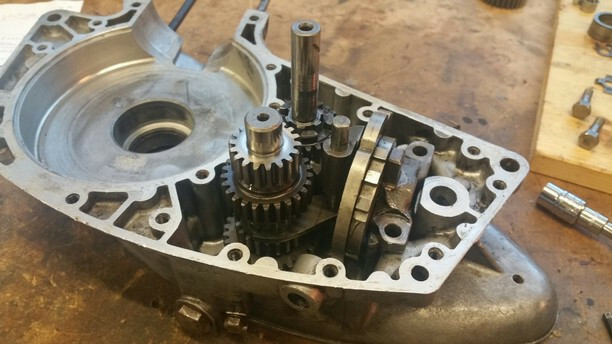 However the write up with all the pics is very helpful for someone trying to find their way around the gearbox ! Great article and pictures, love to see one like that for 3 speeder. 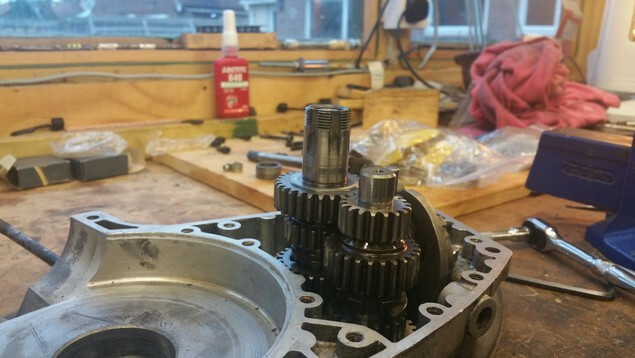 I have a D7 with earlier shafts and gears. Wondering about way to improve "claw" to racket plate for better contact. Anyway, nice job. 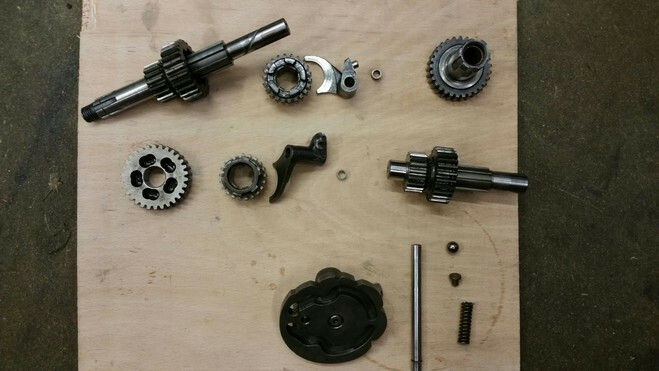 I modded the claw on my 4 speed to get a better bite on the quadrant..pics it you like Francis.